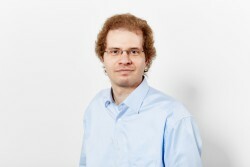 My name is Marcel Platz and I founded geldempfehlung.de in 2013. I had 2011 the vision that investment consulting can be digital. We are offering an automated recommendation portal for private investors based on algorithm. We ask the customer about 30 questions about his desire. Our software checks first the asset classes like bonds. Then 40 types of investment will be checked, for example stock funds Europe, life insurances and the German products “Riester-Rente” and “Rürup-Rente”. Finally the customer gets personal recommendations for the best products of each fitting investment type. Comparing products and investment types are typical useful functions for our customer. At the end of the process the customer gets the protocol according to German law. Our process is more complex but the customer has the advantage to find the fitting products in an easy way. We started the public beta-test in December and launch our service in march 2015. Direct competitors are automated investment guides. Most of them are concentrating on ETF products. We took the uncomfortable way and are checking all investment types. I started our business with government subventions, savings and earnings from another software project as freelancer. Finding team members as co-founder is and was really hard. Some were talking much but they haven´t done enough. It´s like a relationship. You are going through good time and bad time. When you went through a difficult step, you know your team very well. All regulatory and legal issues are a big challenge for our business model. We are digitalizing processes which were only done by humans before. We have to adopt our investment platform according to the law. I like personal finance solutions and payment solutions for bank accounts on mobile devices. Paying with your smartphone is not really comfortable at the moment. I would like to use it more often and enjoy it. Markets are changing and growing fast in Finance and insurance because digital processes are not so distributed. Young people prefer mobile banking on tablets and smartphones. This area can grow, but usability is most important. When you are paying with your mobile device in the supermarket and it takes longer as by cash card, only some techies and early adopters will use it. Acceleration of FinTech start-ups is possible with good public relations and media contacts. I think the FinTech Forum is the first step to start this process.